Take in the sights and sound of the beautiful Atlantic Ocean from the dune top deck at Almost South II. Enjoy the peace and quiet of South Nags Head in the lower unit of this comfortable Oceanfront duplex, which is just right for the small family or fishing enthusiast. 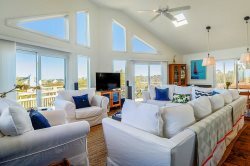 Close to Oregon Inlet as well as the wealth of activities and attractions in nearby Manteo and Nags Head, this charming beach retreat serves as a perfect launching point for a wealth of beach adventures. Step inside, and let the good times begin in Almost South IIs central living area with nearby dining areas and well-appointed kitchen. This vacation rental features three thoughtfully outfitted bedrooms that are perfect for a good nights rest, and guests will be just steps away from the ocean, thanks to the convenient beach boardwalk thats found right outside the door. With so many ways to enjoy the beach scene, Almost South II is the perfect destination for coastal fans of all varieties. Just right for the small family or the fishing enthusiast, Almost South II is located only a few miles from Oregon Inlet. Have a larger family group? Combine with Almost South I to enjoy a larger family getaway. Save $100 instantly when both units are booked simultaneously. Ground Level: Private laundry room, Enclosed Outdoor Shower.